It’s time again for another tool in the “I’m-Not-a-Morning-Person-Toolkit!” I love the following recipe because it is hearty and wholesome but can be mostly made ahead, saving me time in the morning. My kids love it because it’s tasty. Combine all ingredients together, mixing well. Store dry mix in an airtight container or quart-sized canning jars. Blend well. Cook pancakes on a lightly oiled griddle. Makes 10 pancakes. To see previous years’ recipes, go here and here. Our online classes ended the first part of May as well as our home school co-op. My kids were thrilled thinking they were done for the year! I explained that we still had lots of learning to do before we officially ended the second week in June with all of their public schooled friends. A few days later at breakfast devotional I introduced the Brimhall University Honor Society. I gave them each a copy to hang in their cubby and to check things off. It is based in BYU's Honors Program, that our daughter is pursuing with gusto! It was a little ambitious but I thought, if we only do half of it, it will give us something to shoot for! Today is June 15th, our last day, and I am pleased to say we've done it all! Each of the topics kept us moving forward in exposing us to great things, reading and asking questions. Going to the play: Meet Mark Twain, where we came face to face with Ryan Clemens, an actual relative to Samuel Clemens! He gave a wonderful one man show and we all came home and each picked up a book by Mark Twain (without my asking or assigning!). For Science we watched a documentary called "Tales from the Hive." Then went to a friend and he opened up his hive for us to see. It was great and our 17 year old son even put on a bee suit to get a closer look! We read classic books and discussed them in our American lit class with a wonderful mentor. We put together a money class and learned all about finances. The kids did projects and planned out our summer vacation and learned how important compound interest is - especially when you are earning it rather than paying it! We loved watching the entire "Lord of the Rings" trilogy plus "The Hobbit", and even watched "Gone With the Wind". We gained a new perspective as we watched a Japanese film, in Japanese! We worked on personal progress and painted our daughters room, after having painter's tape up for six months awaiting painted stripes. We had to search for some things but others were easy. End of the year recitals filled our requirements for music. Service hours were easy too; helping someone move, volunteering at the library, typing up girls camp schedules. We talked about the activities as a family and dad was included in many of our adventures! One of our favorites, visiting a local art gallery and visiting with the artist for 45 minutes! This was a great way to spend our last month of school, even though we had lots of other things going on as well! It was a wonderful way to spend time with each other and could easily be done over the summer! We invite each family to choose a country and learn all about it: fun facts, geography, famous people, animals that live there and especially what they do to celebrate Christmas. Children can make a poster to share or present something that they learned to the group. French Crepes to name a few! We send out our invitations early for everyone has time to prepare. 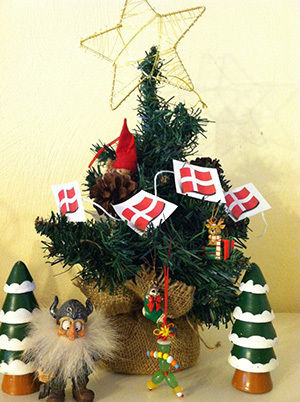 We invite each family to decorate a small Christmas tree with ornaments that tell about their country and to bring a traditional food. We display all the trees on the tables with the food. During the evening we enjoy a wonderful meal and each family gets to present their country to all the rest. We also enjoy singing Christmas carols and have even tried to sing them in different languages! A fun night for all! We never know when a teaching moment will take us by surprise. I just know that you have to be ready to shoot from the hip when it happens! This summer, while the grandkids were over for the afternoon, I started hearing all sorts of squeals coming from the back yard, and they weren't squeals of delight. I raced out the back door to hear the kids saying, “Snake! Snake!” I am thinking to myself, 'Snake? Here? What kind of snake could of gotten into the yard?' (Brief memories of my own encounter with a 9 ft diamond back rattler in the Arizona desert came to mind. But reason soon shook that thought aside as I didn't think a rattler had made it this far into town.) As I went through the patio door I saw a slither and had to hide my smile. I knew this was something I could manage. The kids were all nestled under the apple tree, still squealing, while grandma quietly overturned a little cat house we have in the back. Quickly surprising everyone, (including myself that I actually was fast enough) I caught the bewildered and fightened young snake. Now I should probably mention, that many years ago I raised an older son who adored reptiles, especially the slithery, supposedly slimy, snake. I told myself that if he could love them enough to follow through and read evey book in the Cypress (CA.) library, including a hefty book on Zoology, I would master my dislike and fear of reptiles... and I did. Someone had to share his passion with him. So because of him I had touched rather large boas and I found out snakes aren't slimy. I had handled other unique reptiles, including my very favorite, and his, – a Sudan Plated Lizard. That experience is what now came into play and gave me the courage and know-how that I needed. I was able to sweep up that fearless little snake and hold it so as not to get bit or cause it harm. After some major coaxing I was finally able to get the kids to come over and take a closer look. I started talking calmly to the kids and they settled right down. I then gave a quick lesson about snakes – safe ones, and those that are not, and I even got them to feel comfortable enough to pet it. My daughter got a few pictures, and in a few awesome teaching moments, the kids learned about snakes. They also learned that Grandma was way cool and they had a fun adventure to share with mom and dad when they came home. We released our new friend over by the canal where they watched it wiggle away and learned by 'seeing' how a snake moves. Then we all ran to the computer to learn more about snakes. Nothing is more satisfying than to see your children (or grand-children) 'on fire' with learning. What better way to experience something exciting than to actually live it. This is what it is all about in teaching our kids; making the classroom come alive, making learning real and fun, and letting their imaginations soar and watching that precious “light come on”. I hope you all have lots of awesome teaching moments this summer.